The lone wolf is the most dangerous predator on American soil. Or any soil where he treads, domestic or foreign. He is the most feared predator. I speak not of the animal in the wild, but the humans among us. I pluralized the people part because the lone wolf is often mistaken as a sole predator without the company of other operatives. That is only partially (but, mostly so,) correct. As we move deeper into this serial about the lone wolves the reader will develop a growing education of what I am referring. We are in an era where the lone wolf will gain greater coverage in the front-page news and prime-time media discussion. I will present these as part of the Homeland or Homeland Wars series of my works which include, along with the Lone Wolf serial, fiction and nonfiction works, as being scheduled for commercial publication as well as related works presented in my blogging projects. The lone wolf is the most feared individual that any law enforcement agency ever encounters. But the lone wolf is not always alone, and I’ll show you why and how I draw that conclusion. The lone wolves sometimes act in packs just like any other predator, they just operate differently and usually pull off strikes alone. A lone wolf by the usual sense of law enforcement terminology is a “domestic terrorist”. I don’t always agree with that statement. He can be domestic or foreign and he can strike at home, in America or abroad. He will strike law enforcement and military symbols of government. He will strike civilians, too. This article is primarily concerned with domestic lone wolves striking law enforcement, but we must keep in mind lone wolves are worldwide and will explode in the next few months and years and become a dominate operating system of both domestic and foreign terrorists at home and abroad. Although they usually operate alone with sudden and dramatic striking force, they often sit in the same classroom, studying the same material, listening to the same lectors and are educated by the same, often identical, masters of influence. In the case of foreign terrorists the meeting places are the universities, social medias and the religious houses that preach the violence and influence young minds to radicalism. The deadliest lone wolves are seasoned combat veterans of the United States Army, but sometimes other military institutions such as the U.S. Marines. Today’s law enforcement is totally ignorant about the operation(s) of lone wolves in America. We are all ignorant to some degree. The basic operation of lone wolves leave us without the ability to foresee strikes that are covert in nature since there is zero communication that is traceable. The only one that knows of an imminent lone wolf attack is the lone wolf unless there is a tight-knit, tight-lipped pack coordination. Rather the lone wolf strikes in America as a domestic terrorist or radical terrorists in a foreign nation against Americans or any other target their motivation is usually the same, revenge and to inflict fear. Revenge and fear are the cornerstones of their terrorism. Whatever it is they want to strike, they do so because the hate what the target represents and they want to destroy it and they want to inflict the highest level of fear when they do so. Weak political and bureaucratic leaders and unjust actions by government will raise the level of lone wolf strikes and inflict the greatest amount of damage. The bad news is we are in an era where lone wolf strikes will increase, and dramatically so. The good news is this series and serial along with my philosophical writings, commentaries, essays, and as well, and if not more importantly so, my works of fiction, will present revolutionary thoughts to prepare for and reduce the damage the lone wolves will rain down on America in the coming ages. That eruption may occur again tomorrow, next week, next month or next year. There is a lot that weighs on the likeliness of lone wolf strikes and domestic terrorist attacks as well as semi-related radical militia uprisings. From power grid strikes to rising law enforcement assassinations to strikes against opposition targets, the lone wolf will be present in daily conversation locally and nationally. Lone wolves are almost always of domestic nature, but can be sympathizers of international terrorism, too, which makes them even deadlier. Their strength is in secrecy and surprise. Little or nothing is traceable until it is too late, after the damage has been done. A single lone wolf can require hundreds, even thousands of law enforcement officers (LEOs) to track them. A single lone wolf can consume millions of taxpayer dollars in the manhunt used to track and capture or track and destroy them and millions more to prosecute if they are taken alive, something which is increasing unlikely. Imagine a thousand lone wolves operating simultaneously or back-to-back across America. Or tens of thousands. Foolish and ignorant law enforcement won’t do anything to reduce these foreseen strikes. Instead, they are unconsciously likely to invite more. They won’t even know what they are involved with until after the strike. Instead, law enforcement needs to rethink, retrain, adjust, adapt and reverse a large portion of the current procedures and policy, including police and public servants attitude toward the public. If they don’t adjust, chances are the blood will shed, and too often, like in any war or conflict, it will be the blood of the innocent. Change to avoid or reduce such premeditated and provoked violence can come only from intelligent thinking and smart leadership, something America seems to often be lacking, yet something that is not impossible to obtain. Watch for the next Lone Wolf installment in either fiction or nonfiction form in the Vegas Valley media group. Lone Wolf: A lone wolf is an animal or human who spends most of their time alone rather than in a group. The definition in this serial (a mix of fiction and nonfiction writing in regularly scheduled installments) is that of a lone person acting in a criminal manner using deadly weapons or fatal methods to attack a specific target, most often police or government, to satisfy a revenge of personal grudge. The vengeance may or may not include civilian targets and casualties and may include a wide range of grievances. There are many different types of lone wolves which are predators preying on a variety of targets including police, government, women or individuals, specific groups and targets. Serial killers and criminals that prey upon nongovernmental targets and objectives, rather individual or groups, can sometimes be classified as lone wolves although they are not commonly considered so. They are in reality lone wolves because they operate alone and it is the solitude operative that makes the lone wolf so deadly and difficult to catch. Unless he or she makes a mistake, leaves incriminating evidence, acts under surveillance cameras or witnesses, talks to someone who might turn informant, the lone wolf is extremely difficult to detect and almost never predicted to strike until after the fact. The Foreign Intelligence Surveillance Act (FISA) classifies a “lone wolf” as non-U.S. citizen or person operatives. I classify a lone wolf as any person or closed cell that conducts acts of terrorism or violence upon individuals or groups including government and nongovernmental facilities, agencies and personnel, inside or outside of the United States of America. Serial: Written works of same story-line released in installments at regular intervals. Examples are a novel released in installments, often numbered. Series: Written works released in a common theme but different story line. Examples Homeland Series or Homeland Wars Series are stories about homeland-American unrest, survival, deep-woods survival, terrorists attacks, lone wolves attacks, foreign invasions, political tyranny, military coup, a coming second civil war, revolution, race wars, Mexican-American conflicts, chaos in the homelands, and such things as American Spring, revolts, etc all occurring in the “homeland” of America and disrupting civilized and modern life as we know it. Note: It can and will be argued that the definition of a “lone wolf” must operate alone in order to be labeled a lone wolf, but in my serial and general series dealing with the human lone wolf I also sometimes refer to a lone wolf cell or a lone wolf pack which for example is an impenetrable, unable to be infiltrated, lone wolf team. Examples are husband and wife, lovers, related persons such as parents and/or siblings and the like who even under torture would not give up information to incriminate the lone wolf cell. Although more than one person works in harmony it is identical as a sole being operating because nothing is compromised. For that reason the stories and essays that will be presented consider such operatives as lone wolves because that is what they essentially are, restrained or lack of communicativeness of all members which makes them ultra deadly. Every writer can write something others may disagree with, I am no exception. Do you believe in astrology? Horoscopes? I do. Sometimes. Why? Because they are so often true. Their hammer doesn’t often miss the head of the nail. For decades I’ve read my horoscope and more often than not they led to mostly true occurrences. At least for me, and sometimes for people I knew. The Church fathers would probably frown to learn such a thing. Christians normally aren’t suppose to believe in some power competing with God–but I believe horoscopes and astrology are God’s plan. After all, we’re talking about something in His universe–His galaxy. He created it, so why doesn’t He rule it? I think He does. Just like He is science when most…or many folks decides to separate the two, and divide them. In my book, God is science. God is astrology. He controls it all. And, it’s not superstition. If anything, it’s a phenomenon. Of course, your horoscope is only as good as your astrologist. One of my favorite astrologists is Rob Brezsny. 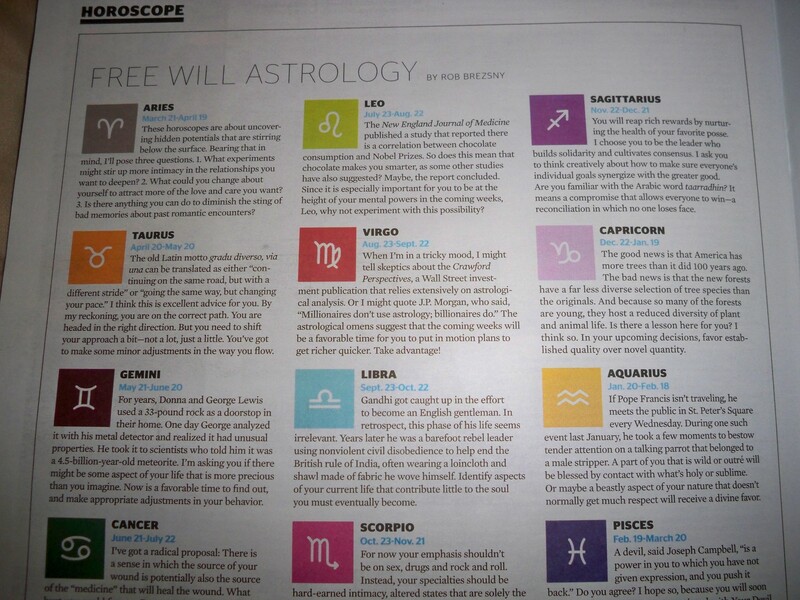 You can find him weekly where I do–in the Las Vegas Weekly (I use the hard copy magazine) or if you want to go to the next level you can reach him here at Free Will Astrology. com for audio or text horoscopes. Call in doesn’t appear to be available anymore since he no longer seems to be connected with RealAstrology.com a former location he used to communicate from. In any event, Rob is readily available at the above connections and his e-mail is available. Anyone who knows me knows the last few years have been turbulent and plagued with one misfortune after another, especially medical and financial. I’m often accused of being negative. That’s because I live in a negative world. I find it hard to be humble and positive when there are so many destructive things around me. Just like I am not radical, as I am sometimes called. Although I am often accused of such, I am traditional, not radical. The world around me is radical. And, it’s becoming more radical everyday. And, those people in that world are on a collision course with doom–but you can’t tell them anything less you are bombarded with insults and innuendos. But Rob Brezsny can sometimes save the day. At least for me, and the night, too. Then it goes on with more detail so specific to the events one must wonder if NSA took a front-row interest in me and are spying on my every thought. The next horoscope not only strikes at the core of long preparation of return to grace, but so accurate the arrow sliced the apple. When did you first fall from grace? Do you remember? It has happened to most of us. We spend time being privileged or cared about or respected, and then, suddenly, we no longer are. We lose our innocence. Love disappears. Our status as a favorite comes to an end. That’s the bad news, Leo. The good news is that I think the months ahead may be time for you to climb back up to one of those high states of grace that you fell from once upon a time. The omens suggest that even now you’re making yourself ready to rise back up–sooner than you think, there will be an invitation to do so. I can’t wait. You bet I’m ready, Rob. Thanks for the directive. I think it rings true. I do know I have been “making myself ready”. And I am. Grab your own horoscope from Rob at one of the links above and if anything else, have fun with it and see how close this astrologist comes in making your inspirations come true. ENJOY! IN THE GAME OF LIFE some people are beaten by their own hand. No matter how much you coach them, try to teach them, it always backfires with a certain type. It ends up the same. Just like the cards, you have to hold them or fold them. It’s hard to let go of a hand you love to hold, but sometimes that’s the only sensible choice. When there comes a point in time when you can’t improve your hand, you can only improve your play and if you can’t do that it only leaves one thing left to do–fold your hand. There are strict rules in every game, even if we don’t think it is a game. Life itself is a game. It’s a game rather we think of it as such or not. It is. There are winners and there are losers and there are those who will hang onto a losing hand, even if it beats them all the way to stone-cold broke. After awhile you just have to let go. It’s better to let go and wait for another hand–hopefully a winning hand–than to push the issue when the odds are stacked against you. The probability of winners against losers always favor the loser. There are far more losers than winners. And if a winner stays at the table too long, he too, is sure to lose. Life is the same way. Identically. A card game or the game of life, they’re played the same identical way. Like Kenny Rogers sang, “You’ve got to know when to hold them and when to fold them.” And if you don’t, you’re going to lose. That line is applicable in both cards and life. Sometimes you can’t coach the player, you just have to let them play their own game and see how the chips stack up or fall. 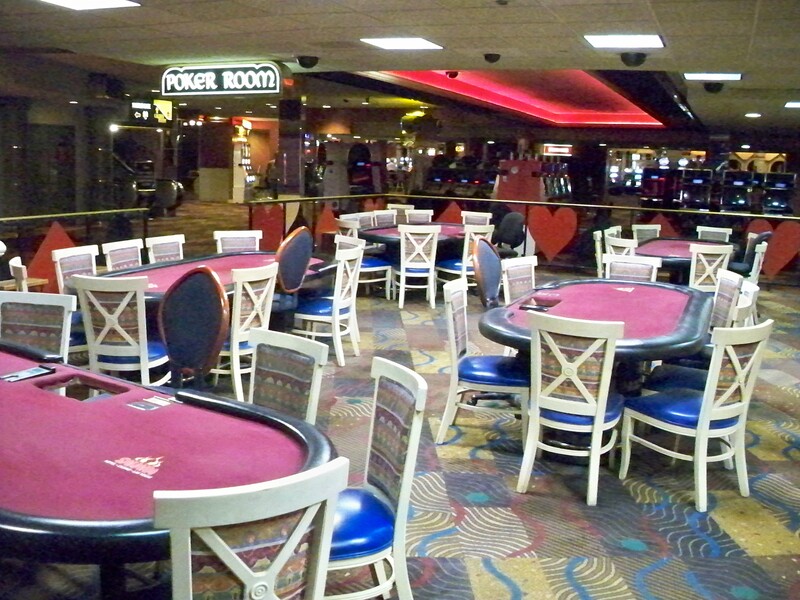 If the chips fall too many times and a player goes all in and loses, they’ll wind up broke and there will be no more game playing for them. They’ll be finished. Someone else will be playing on their dime. For some, rather playing too long at a poker table or the table of life, they wind up pushing a shopping cart on a street full of losers. Every town has at least one such street. Nearly every one on those streets have a broken heart–they lost something that was dear to them. That’s not a destiny most vision, but it’s one an awful lot of folks find themselves landing in. It’s all because of the decision of which cards to hold and which ones to fold. The cards of life come with a much higher price and a much bigger risk. Should the U.S. Partner with Iran to Destroy ISIS? Should we partner with Iran to wage a joint war against the self-named Islamic State of Iraq and Syria? The short answer is yes. Yes, but you will never see it happen. Why is it a yes, that we ought to partner with a symbolic foe against a common enemy? Why? There is a long-stirring division between our two countries primarily over Iran’s nuclear enhancements. The left and the right say no to partnership with Iran because of that long-term dispute over nuclear achievement, among other things such as knowledge that Iran supplies weapons to other terrorist organizations. Are we not also currently at odds with Russia and Vladamir Putin over issues such as Ukraine? But don’t we have a lasting relationship or partnership with science, space exploration, space-station research and transit and with medical knowledge sharing as well as other social endeavors? We certainly do and none of them are being threatened to be scrapped due to our differences over Ukraine or with political opposition. So, why can’t we use the same logical sense and apply it with Iran? Besides, if we did we just might turn a foe into a less hostile adversary. We have absolutely little to lose by teaming up with Iran in a coalition against ISIS terrorists. If anything, we stand to gain since Iran just might unleash the exterminating powers needed to rid the world of the most barbaric subhuman existence known to modern man. Iran is a Shia Islam nation and the ISIS are Sunni. They are similar in belief, but yet have differences. There is nothing more perfect than a radical Islamic nation joining the fight to exterminate a radical Islamic wanna be. If there is, let me know what that might be. Or, is it that we don’t want to exterminate the ISIS? Maybe we want to house them down in Gitmo so we can let them loose later on so they can breed and regenerate. There are some who call themselves Americans who would enjoy just such a thing. A partnership with Iran is not a bad idea to fight the ISIS, an organization which could have and should have been eliminated or at least severely reduced months, even years ago, if we had leaders in this country and around the world. Such partnership is by no means an offer to climb into bed together. We shouldn’t trust the Iranians, but if we are to have no boots on the ground, then trust ought not be an issue. It is a single mission to conduct a single outcome; to destroy the ISIS terrorist movement. Period. We need to rethink, ah, but the problem, do we have leaders who can think?